The image above was taken on July 1st at the Foteviken Viking Museum during the annual market there. I saw this group of musicians sitting in the shade, playing to an audience of kids who were all enjoying the medieval sounding music. Thankfully the sun went behind the clouds above the houses long enough for me to snap this cell phone shot as well as a few analog pictures before I would have had to shoot into the sun (it would not have looked as nice as this one!). July was most definitely a month of dry weather (we didn't really get any rain at all...just like in June) and also very hot weather, peaking at several days over 30 degrees Celsius at the tail end of the month. It was also a month full of football (or soccer for my American friends) on TV. This was taken on July 6th, a day before Sweden was to play against England in the quarterfinals, in my local neighborhood. The funny thing was that this wasn't the only house on that one street that had a giant team jersey hung on the wall! Never seen that before, but I thought it looked pretty cool (although I wouldn't want it on my wall!). An image taken while I waited for an appointment for an examination at the local hospital in Lund. I thought the morning light flooding through the huge windows of the lobby would make for a cool silhouette image, so "all" I had to do was to wait for someone interesting to walk by and let the camera focus and measure the light on the outside of the place. A high contrast treatment in Snapseed and there's your image! I think this is the kind of image I would not have taken before these 365 image challenges I've given myself three times now. It has trained me to look for images in more places and situations than I did before. So when you see an intriguing shadow on your kitchen floor...take the picture! With a bit of black and white treatment to clean up distracting colors you have yourself a shadow monster...sort of! This is a pretty self-explanatory image I think. 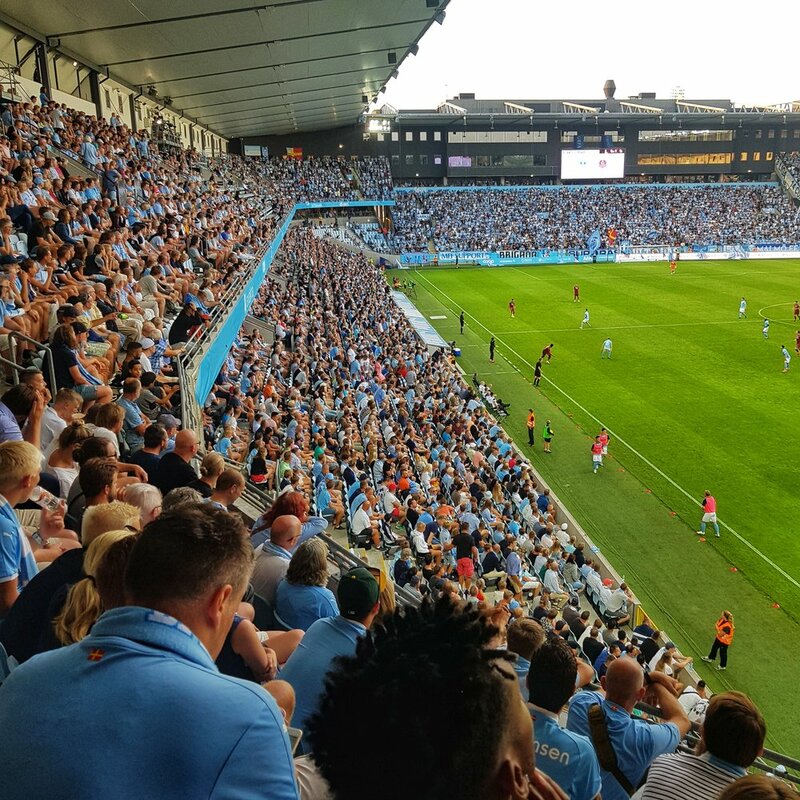 It's just before kickoff at the game between Malmö FF in the light blue and Östersund in the red and black jerseys. I had done some shooting in the park before the game with my analog setup so I had my shoulder bag full of old cameras with me, and I had to talk a very zealous security checkpoint person into that I couldn't really take any valuable pictures with my 50 mm analog camera. Thankfully his supervisor seemed to know a bit more about camera gear than he did so I was able to get through. So, I figured I'd have a go at shooting with the phone instead at the game. In this image I particularly like how the players of each team are all focused inward; to them everyone else in the stadium are of no importance in that moment. This image is from Den Blå Planet (The Blue Planet), a huge aquarium just outside of Copenhagen in Denmark. I went there with a few other photographers in a local Facebook group I'm a member of. I didn't expect a lot of successes as far as photos go, because it is notoriously tricky to shoot in those places, given that the light is pretty dim in many of the rooms for the sake of the fish and other creatures (which I am totally okay with, the place is there for THEIR benefit...not for the photographically inclined!). Still I think I managed pretty well with this shot of a school of herring swimming by. The black and white treatment on this shot I think promotes the silvery blur of a look these fish provide when they zoom by. The “cover” image for August is taken at the parking garage at the local hospital. I drove my dad there to have an examination, and when we went down the stairs to the exit I was intrigued by the light coming in through the glass blocks. I guess it goes to show you can find things to photograph almost anywhere as long as you keep your eyes open! A somewhat self-explanatory image and title I think. I had the privilege of seeing my favorite team, Malmö FF take part in the qualifying games for the Champions League of 2018-2019. In the end they didn’t qualify for that, but for the slightly less money-thick Europa League (and even went through the group stage to play among the final 32 in February!). The Stadion arena is a great place to watch football and there isn’t a bad seat in the house! I’ve been to almost all the sections by now (except for the luxury boxes that is) and it’s an enjoyable view from all of them…provided the team plays well, which they did in the last half of 2018. The first half though…not so much! Day 216 - August 4: C'mon little one! This way! The summer of 2018 was intensely warm and dry, and both the heat and the drought lasted for a very long time. So it’s hardly surprising that my brother’s dog Molly, which I took care of for a few days while my brother’s family went to Germany wasn’t all that keen on taking a long walk in the sunshine! She prefered to stay close to home and to walk in the shade. Pretty smart dog I’d say! Certainly a lot smarter than some humans! This picture is one I took with both phone and analog camera while at the annual Malmö Festival. Just as I expected the cell phone version came out tack sharp (the Samsung S8+ takes pretty amazing pictures in the right conditions), while the analog one came out blurry…but that was intentional, since I took it at a slightly slower shutter speed to get a motion blur effect going. It can be seen in the Streets gallery on this site, or straight to this address. For many years I’ve taken the bus into central Malmö, and just off one of the busier ring roads there’s the Eastern Cemetery. I’ve seen a few pictures from there by fellow photo club members and I made a note to myself several years ago to go there to take pictures, because it looked so interesting. But…as often happens you forget those notes, so last time I did a 365 project I never went, nor did I go in 2017…so this year I really put some effort into remembering to go! When I got there I saw on the information board that apart from the “regular” cemetery there was also a Jewish as well as a Muslim cemetery (funny enough these were located right next to each other across a small road). While the Jewish cemetery was very low-key with very formal and non-adorned tombstones the Muslim one turned out to be more interesting with its varieties of all kinds of monuments and epitaphs for the deceased, depending on which part of the Muslim world the person had come from, what culture and perhaps what socio-economic bracket they were part of. Still, they were all there, side by side, taking up an equal amount of ground. I will definitely go back there again in the upcoming year to shoot some more! 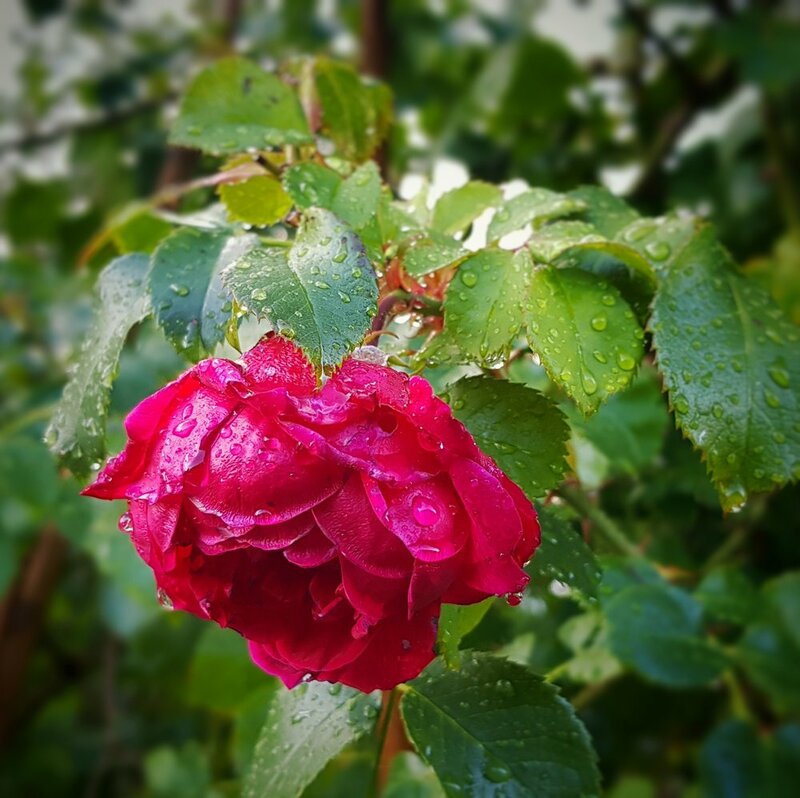 Sometimes a rose is just a rose (or something like it…I don’t have my Shakespeare memorized). In August the drought we had from the month of May finally relented and we got several downpours dumped on top of us. One of these happened as the family was celebrating my sister-in-law’s birthday in their garden. Fortunately enough we had a roof to be underneath…and the worst rain didn’t last very long. After the worst of it had stopped I took a short walk in the garden and spotted this lovely flower with some rain drops still on it. I think the Samsung S8+ did pretty nicely with the close-up shot!